A 105-year-old construction-services company tackles one of the largest U.S. construction projects of its kind, using cutting-edge automated structural monitoring. n 2009, the U.S. General Services Administration awarded Clark Construction Group, LLC, the $435-million design-build contract for the U.S. Coast Guard (USCG) headquarters building in Washington, D.C. As the first step of the Department of Homeland Security’s consolidation efforts, the new headquarters facility is being constructed on the grounds of the St. Elizabeth’s West Campus, a designated national historic landmark in the District’s Anacostia neighborhood. American owned and operated since 1906, Clark Construction Group, LLC, has grown from a small excavating company to one of the nation’s most experienced and respected providers of construction services. Headquartered in Bethesda, Maryland, Clark has regional offices across the country and specialized divisions and affiliates that perform all manner of general building and heavy/civil projects. To make the USCG project a success—particularly the project’s complex foundations work—would test the knowledge and skill of Clark’s breadth of services. The USCG project will create a campus that’s 1.2 million square feet, including an 11-story office building, a central utility plant, and two seven-story, stand-alone parking garages. In addition to core and shell construction, Clark will complete the interior fit out for the headquarters building, including audio/visual telecommunications systems and advanced security features. The project team is targeting LEED Gold certification. Among the office building’s notable sustainable elements are an approximately 400,000-square-foot green roof area and high-efficiency mechanical and electrical systems. Additionally, the construction of wet ponds, bioswales, and step pools will assist with stormwater management. Responsible for the massive support of excavation at USCG headquarters is the Clark Foundations group, a subsidiary of Clark Construction Group, LLC. The project required 300,000 square feet of support of excavation, more than 10 times the amount required by a typical Washington, D.C., office-building project. Clark Foundations’ overall scope included the design and installation of more than 1,450 driven and drilled secant, tangent, and bracket piles with timber lagging. The system also includes approximately 2,200 temporary and permanent tiebacks up to 110 feet long. Depending on the size, a tieback could require up to 12 workers to install. Located on a hillside in southeast Washington, D.C., one of the USCG project’s most visible foundation challenges is the 120-foot change in elevation. Given the site’s topography, nine of the office building’s 11 floors are located below grade. For Clark Foundations, this meant that 60% of their scope of work was below ground. Further complicating Clark Foundations’ efforts, early geotechnical reports of the 176-acre site revealed several hidden challenges, including the presence of a municipal dump that dates back to the Civil War. Tests revealed unstable soil conditions far below the excavation. To prevent any below-grade sliding beneath the planned office building and garages and nearby existing buildings, Clark Foundations developed a global stability support system and designed and installed the immense support of excavation. The Clark Foundations team also created the project’s deep foundations system that includes approximately 1,400 vertical and battered, driven, precast concrete and steel piles. This system includes more than 1,800 three-foot- to nine-foot-diameter drilled shafts ranging from 30 to 110 feet deep. Clark Field Engineering Group, partnering with Christopher Consultants, laid out this system using GPS and conventional surveying techniques. As of May 2011, the USCG headquarters project continues to progress at a rapid pace. On August 1, 2010, the Clark team celebrated a major milestone: one million cubic yards of dirt moved. Trucks have been hauling dirt an average of 16 to 20 hours a day (except on Sundays). In all, Metro Earthworks (another Clark subsidiary working in a joint venture with Total Engineering) will have excavated more than 1.6 million cubic yards of dirt from the site. installing site utilities and stone masonry. In the past, numerous worldwide accidents and disasters have shown significant risks associated with large construction projects. The monitoring of manmade structures and potentially dangerous natural areas has become increasingly important. It is often necessary to immediately analyze the measured data and to inform the responsible people when movements exceed established tolerances. Monitoring and deformation analysis present some of the most sophisticated challenges in the surveying industry today because they require the highest accuracy, maximum reliability, automatic measurements, and advanced computation and analysis tools. Therefore, aiding this project’s rapid progress and contributing to its safety is a fully automated lateral displacement and vertical settlement monitoring system. Clark Construction maintains a staff of 45 to 50 construction surveyors, referred to as field engineers. The Clark Field Engineering Group has a long history of conducting structural deformation monitoring on hundreds of Clark’s construction projects throughout the country. Monitoring structural movements, however, posed a much greater challenge than those of past projects due to the size of the USCG project, currently the largest construction project of its kind in the country. 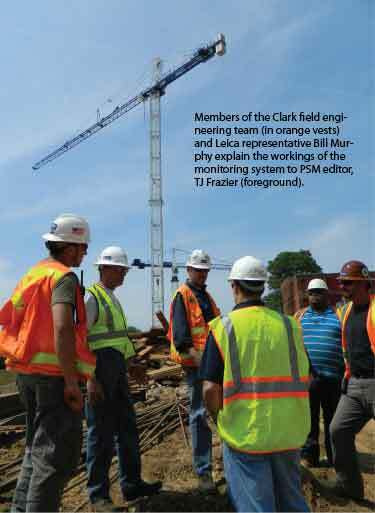 Clark’s Field Engineering management estimated that the use of Clark’s standard monitoring techniques at the project would require a minimum of seven employees dedicated to monitoring fulltime. Clark, at the time, was using only five regular employees to provide field engineering and surveying services to the project, so this would constitute an untenable major expansion of their activities. The unavoidable conclusion was that the monitoring program could not be affordably implemented using traditional survey techniques. In order to reduce the cost of the monitoring surveys, Clark sought a method for automating the observing procedure. Measurements with a robotic total station, it was determined, could be done much more economically. The monitoring points could be equipped with relatively inexpensive, permanently mounted prisms, and many points could be observed from a single location. Furthermore, with specially designed software, the sequence and timing of measurements could be programmed to take place without operator intervention. A fully automated monitoring system could also be activated remotely, and the system could be programmed to collect measurements as often as desired, day or night, with virtually no increase in cost. The labor costs in this scenario could be reduced basically to equipment inspection and maintenance. The decision to implement an automated structural deformation monitoring system on this project was much less intimidating due to prior experience on the West Automated People Mover project at Dulles Airport in northern Virginia. Back in 2004, Clark had undertaken the unusual move of incorporating a similar monitoring system, in-house, on the Dulles project. That provided a comfort level with the technology. 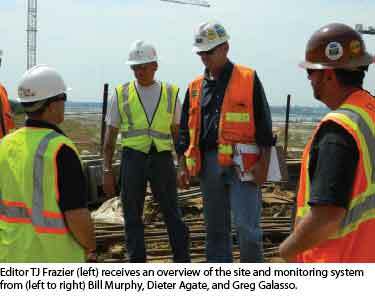 The system specified by the Washington Metropolitan Airports Authority, the supervising agency in the $3.4-billion-dollar global expansion of Dulles Airport, specified a multi-tiered monitoring system using robotic total stations configured to take continuous, real-time readings to reflectors installed at predetermined locations on existing structures and on elements of the support of excavation. Recognizing the large-scale investment required to bring this technology in-house, field engineering manager Dieter Agate and his team conducted extensive research of automated monitoring systems—methodology that was still in its infancy. Clark’s Dulles survey team reached out to various vendors and suppliers of surveying equipment and gleaned insight from geotechnical subcontractors who were also beginning to explore this technology. Agate determined that the only available robotic total station that could withstand the specified requirement of continuous monitoring was the Leica TCA 1800. Based upon that conclusion, the Clark team contacted Bill Murphy, the local Leica representative. Murphy and the Clark field engineering team designed an automated monitoring system using four TCA 1800 robotic total stations coupled with the Leica GeoMoS automatic monitoring system. Leica GeoMoS is a multi-purpose automatic deformation-monitoring software that supports a range of geodetic and geotechnical sensors to detect and analyze movement and aid in predicting and preventing failures. It can be deployed in a variety of environments, such as structural deformation monitoring landslide and settlement detection and automated surveys. 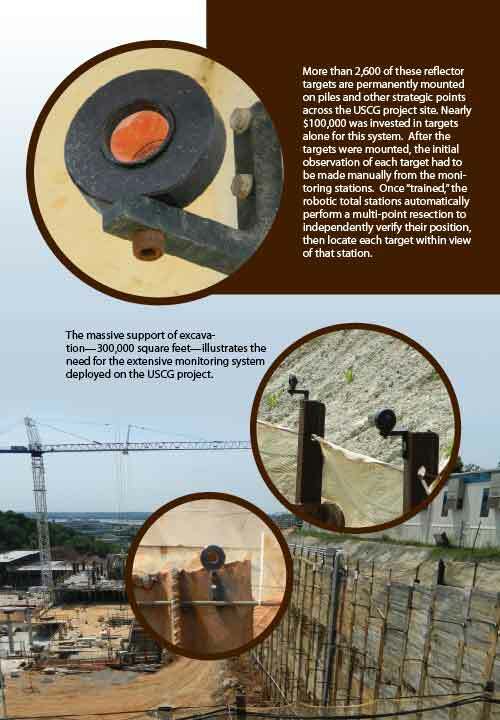 As one of the largest construction projects in the United States, the USGS project required a robust, reliable, and cost-effective system to carry out displacement measurements during the three-year project. As at Dulles, Clark again opted to use the TCA1800 robotic total stations in an automated monitoring system. The TCA1800 total station, which has a nominal distance standard deviation of ±1 mm ±2 ppm (for a single measurement) and a direction standard deviation of ±1 arcsecond (for the mean of measurements in both telescope faces), is a robust and reliable instrument with superior precision and accuracy capabilities. The inherent difficulties of the installation of a similar, but improved, system of the type used at the Dulles project, though still a challenge, were mitigated by the previous collaboration between Clark and Leica Geosystems. Based upon this partnership developed during the installation of the first-generation GeoMoS-based system, Clark decided again to employ the services of Murphy and the Leica Geosystems group. Implementation required the support of Clark’s vice president, Ronnie Strompf, and very close collaboration between monitoring manager Aquiles Torres, project party chief Greg Galasso, and Bill Murphy and Craig Hewes, also of Leica Geosystems. 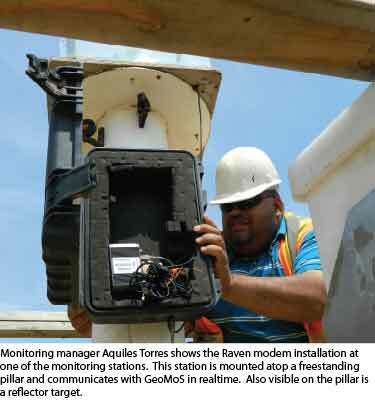 The GeoMoS portion of this monitoring system is primarily a total-station monitored system. Four Leica high-accuracy robotic total stations are used in conjunction with the GeoMoS software. The TCA1800/System1200 robotic total stations are each mounted on steel pillars enclosed in non-reflective glass enclosures with air vents to keep the instruments’ internal temperatures in check. Initially there was no permanent power source available for the instruments, so the solution was to use deep-cycle marine batteries, alternating each battery during charging. Each battery could power the instruments for roughly one week. This is quite amazing considering these instruments are continuously running 24/7, monitoring more than 2,600 target points. Co-located with each instrument are Raven X EVDO wireless modems for data transmission. The target points consist of permanently mounted L-bracket monitoring prisms located on soldier beams, existing historic buildings, existing ground/slope points, etc. The initial step in the target acquisition sequence was the collection of initial readings to all visible targets from each instrument station. Approximately 500 targets were visible from each robotic total station; the operator was required to guide the instrument to each target in turn so that an initial reading could be collected. These initial readings were stored in the database and are used to approximately locate each target during a measurement cycle. Upon completion of each measurement cycle, the instruments ascertain their 3D positions via resectioning to three or more control points located outside the area of influence. The resultant data is posted on a dedicated website accessible by all responsible parties involved. If any movement beyond established tolerance thresholds is exceeded, warnings can be broadcasted via numerous methods to ensure safety of life, equipment, and materials. The automated monitoring system was first activated in February 2010. In the 18 months since its implementation, the system has measured the positions of its approximately 2,600 monitoring points more than one-million times, proving that robotic total stations can be used to create a reliable, cost-effective, and highly accurate system for structural deformation monitoring. When compared with alternative methods, the use of robotic total stations has been found to be a very cost-effective method for structural displacement monitoring. The ability to measure a large number of points from each station, combined with the capacity for fully automatic data collection, while still meeting stringent positional tolerances, gives robotic-total-station measurements a significant advantage over other monitoring techniques. Dieter Agate is field engineering manager with Clark Construction Group, LLC, headquartered in Bethesda, MD.